Department of Integrative Biology and Physiology, University of Minnesota Medical School, Minneapolis, ... 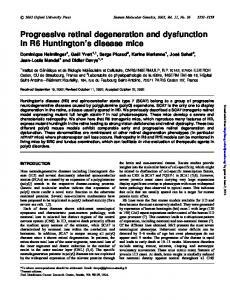 The mdx mouse is a genetic model of DMD that dis-. Jan 31, 2009 - Cite journal as: J Gerontol A Biol Sci Med Sci. All rights ... The Johns Hopkins Medical Institutions, Baltimore, Maryland. Background. ..... We would like to thank Dr. Marilyn Albert for providing important feed- back on an earlier ..
the objects in front of her, âblurred visionâ and problems learning new ... Her son-in-law reported that ... did so when it was placed in her hand or upon hearing its. 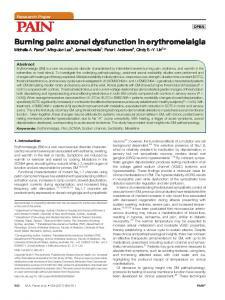 Jan 24, 2017 - To investigate the underlying pathophysiology, peripheral axonal excitability studies were ... neuropathy.76 The warmer temperature may be expected to .... cramp or fasciculation and demonstrated with mexiletine therapy. Dec 9, 2009 - vascular dysfunction in both small renal and systemic arteries pre- cedes renal .... Small renal (interlobar) arteries (200 â250 m) and third-order. with Ross's syndrome and postganglionic Horner's syndrome. Neurology. 1995;45:2094â6. 22 Benarroch EE, Smithson IL, Low PA, et al. Depletion of. Mar 12, 2008 - ... M. Inman,1* Wendi Lambert,1 Ericka Oglesby,4,5 David J. Calkins,2 Michael R. Steele,3 .... St. Louis, MO) in TB (block solution). ... After final rinsing (three times in TB), whole-mount ...... Axon degeneration without cell body. tom row) and secondary Texas Red anti-rabbit IgG. Fluo- rescence microscopic .... Nogee, L. M., D. E. deMello, L. P. Dehner, and H. R. Colten. 1993. Deficiency. Dec 20, 2016 - Avshalumov MV, Chen BT, KooÂ´ s T, Tepper JM, Rice ME. 2005. ..... Regulation of substantia nigra pars reticulata GABAergic neuron activity by. May 2, 2014 - Mutations in the spastic paraplegia gene SPG11, encoding ... of motor cortex dysfunction in autosomal-recessive hereditary spastic paraplegia. Feb 9, 2017 - Jia-Ying Sung1,2, Jowy Tani1,3, Tsui-San Chang2, Cindy Shin-Yi Lin4,5*. 1 Department of ...... Cherian PV, Kamijo M, Angelides KJ, Sima AA. Sep 16, 2011 - 2 Department of Neurology, Sydney Children's Hospital and School of Women's and Children's Health, University of New South Wales, Sydney,. 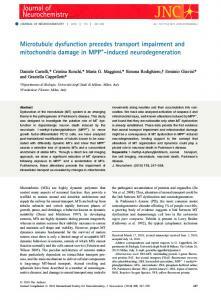 To evaluate the development of diabetic neuropathy, the current study examined changes in peripheral axonal function. Nerve ..... Grading of chemotherapy- induced ... zotocin-induced diabetes on the rat brain antioxidant status and the. From the 1Department of Neurology, Wan Fang Hospital, Taipei Medical University, Taipei, Taiwan; 2Neuroscience Research Australia and Prince of Wales Clinical School, University of New South Wales, Randwick, Sydney, New South Wales, Australia; and the 3School of Medical Sciences and Translational Neuroscience Facility, Faculty of Medicine, University of New South Wales, Randwick, Sydney, New South Wales, Australia. Corresponding author: Cindy S.-Y. Lin, [email protected] Received 26 October 2011 and accepted 6 February 2012. DOI: 10.2337/db11-1509 Ó 2012 by the American Diabetes Association. Readers may use this article as long as the work is properly cited, the use is educational and not for proﬁt, and the work is not altered. See http://creativecommons.org/licenses/by -nc-nd/3.0/ for details. nerve. Abnormal studies were deﬁned as outside the normative range for amplitude, latency, or conduction velocity, as deﬁned by normative values per center. NCS were undertaken as per routine clinical practice, assessing the median, ulnar, peroneal, tibial, and sural nerves using standard clinical neurophysiology equipment. To assess clinical symptoms, a standard neurologic examination was undertaken, comprising assessment of sensory and motor symptoms, evaluation of deep tendon reﬂexes, muscle strength, and sensory function, including pinprick and vibration sensibility. If patients demonstrated clinical symptoms of neuropathy as determined by clinical assessment or if NCS results were abnormal according to criterion 3, patients were classiﬁed into the DN cohort. 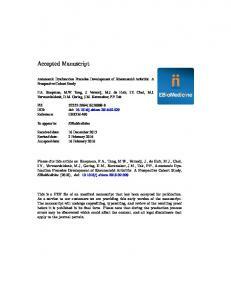 Patients also were classiﬁed into neuropathy grades using the composite total neuropathy score (TNS) (25). A reduced version of the TNS was used (26), comprising eight categories, each graded from 0 to 4, for a total score range of 0–32 points. Categories included the extent and severity of sensory and motor symptom reports, assessment of deep tendon reﬂexes, muscle strength testing, vibration sensibility (128-Hz tuning fork), pinprick sensibility, and tibial and sural nerve amplitudes, with 0 corresponding to no dysfunction and 4 to severe dysfunction. Patients were grouped into three groups based on TNS scores, corresponding to neuropathy severity: grade 0 with no neuropathy (TNS score 0–1), grade 1 with mild neuropathy (TNS score 2–8), and grade 2/3 with moderate/severe neuropathy (TNS score 9–24). Routine blood tests were undertaken to obtain values of glycosylated hemoglobin (HbA1c) and estimated glomerular ﬁltration rate (eGFR), within 3 months of the date of nerve assessment. Nerve excitability measurement and parameters. Nerve excitability studies were undertaken on the median nerve, stimulating over the median nerve at the wrist and recording compound muscle action potentials (CMAPs) from the abductor pollicis brevis, as per previously detailed protocols (20). A stimulus current was applied using an isolated linear bipolar constant-current stimulator (DS5; Digitimer, Welwyn Garden City, U.K.). Stimulation and recording were controlled by software (QTRAC version 9; Institute of Neurology, London, U.K.) using the multiple excitability protocol, TRONDNF. The changes in current required to produce a target potential corresponding to 40% of the maximal CMAP were tracked (20). Latency was deﬁned as the time delay (ms) between stimulus onset and peak CMAP response. Skin temperature was monitored at the site of stimulation and was maintained at .32°C. The TRONDNF protocol incorporated the following measures: 1) a stimulusresponse curve; 2) threshold electrotonus (TE) utilizing subthreshold 100-ms polarizing currents in both depolarizing (TEd; +40%) and hyperpolarizing (TEh; 240%) directions to alter the potential difference across the internodal membrane; and 3) recovery cycle using a paired pulse paradigm with a supramaximal conditioning stimulus followed by a test stimulus at interstimulus intervals from 2 to 200 ms to assess the characteristic excitability changes following an impulse (20). The relative refractory period (RRP) was measured as the duration at which threshold change recovered to its control value, superexcitability as the maximal threshold reduction, and subexcitability as the maximal threshold increase after an interstimulus interval of 10 ms. Data and statistical analysis. Data are presented as means 6 SEM. P values #0.05 were considered signiﬁcant. Independent t tests (two tailed) or one-way ANOVA with Dunnett t post hoc tests were used to compare groups as appropriate. Pearson R or Spearman r, depending on the normality (Lilliefors) correlation coefﬁcients, were used to assess the relationship of excitability parameters and clinical markers. QTrac P (Institute of Neurology) and SPSS (version 19; IBM, New York, NY) software packages were used for data analysis. The demographic and clinical proﬁles of 108 diabetic patients are summarized in Table 1 and Fig. 1. 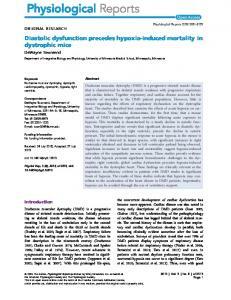 In total, 52 patients were classiﬁed with neuropathy (DN group) and 56 were classiﬁed without neuropathy (DWN group). DWN patients were all graded with either none or mild clinical signs of neuropathy (35 patients were classiﬁed as grade 0; 21 were classiﬁed as grade 1), whereas DN patients were all clinically classiﬁed as having mild or moderate/severe neuropathy (21 patients were classiﬁed as grade 1; 31 were classiﬁed as grade 2 or 3). Early changes in axonal excitability in diabetes. In comparison with healthy control subjects, there were alterations in several nerve excitability parameters in diabetic patients without neuropathy (Table 2). The stimulus required to produce a response of 50% maximal CMAP (P , 0.005) and the rheobase (P , 0.005) were signiﬁcantly increased, indicating that the threshold of the nerve had increased. Differences also were noted in TE (Table 2), with reductions in a number of parameters consistent with decreased accommodation to polarization (27) (TEh [overshoot] P , 0.005; TEd [10–20 ms] P , 0.05). In the recovery cycle, superexcitability was signiﬁcantly decreased (P , 0.05). Likewise, nerve excitability studies identiﬁed the same pattern of early abnormalities in patients classiﬁed with no clinical symptoms (grade 0), with signiﬁcantly increased threshold (4.7 6 1.1 mA; P , 0.01) and rheobase (3.1 6 1.1 mA; P , 0.01) and reductions in depolarizing TE (TEd 10–20 ms, 67.6 6 1.1%; P , 0.05) and superexcitability (223.0 6 1.0%; P , 0.01). These ﬁndings suggest that nerve excitability parameters may be more sensitive to preclinical changes in diabetic nerves than traditional NCS or clinical scales. Progressive excitability changes in diabetes. There was a progressive trend of changes between the excitability proﬁles of healthy control subjects and DWN and DN patients (Fig. 2). The stimulus-response curve was signiﬁcantly shifted to the right (P , 0.05) (Fig. 2A and Table 2), indicating that nerves were progressively more difﬁcult to activate. The rheobasic current increased, demonstrated by the steeper slope of the strength-duration relationship, also indicating that a greater current was required to elicit the target potential as neuropathy progressed (P , 0.05) (Fig. 2B). There also was less change in the proﬁle of TE waveforms (Fig. 2C), demonstrating less accommodation to polarization as the severity of neuropathy increased and “ﬂattening” of the recovery cycle curves (superexcitability; P , 0.0001) (Fig. 2D). FIG. 1. Flowchart categorizing 108 diabetic patients into patients with (DN group) and without (DWN group) neuropathy and subsequently into neuropathy severity grades 0, 1, and 2/3, according to TNS. FIG. 2. Nerve excitability changes in patients with diabetes. Healthy control subjects are depicted by solid lines, DWN patients as open circles, and DN patients as ﬁlled circles. A: Progressive changes in stimulus-response curves, demonstrating increasing stimulus threshold. B: Strengthduration relationship, with increased rheobase in patients with diabetes. C: TE curves demonstrating reduced threshold change in patients with diabetic neuropathy. D: Recovery cycles illustrating reduced progressive reductions in superexcitability and subexcitability. FIG. 3. Comparison of excitability ﬁndings between healthy control subjects and patients with diabetes (TNS grades 0, 1, and 2/3). A: Latency (ms) was signiﬁcantly increased in grade 2/3 patients. B: RRP (ms) was prolonged in grade 2/3 patients. Recovery cycle parameters (C) superexcitability (%) and (D) subexcitability (%) demonstrated signiﬁcant changes in all TNS grades. E: TEh (overshoot) was reduced in all TNS grades. F: TEd (10–20 ms) was reduced in patients with TNS grades 1 and 2/3. *P < 0.05; **P < 0.005; ***P < 0.0005. FIG. 4. Correlations in diabetic patients without neuropathy (DWN group) between (A) HbA1c level and latency and (B) HbA1c level and subexcitability, demonstrating correlations between high HbA1c levels, increased latency, and reduced subexcitability. 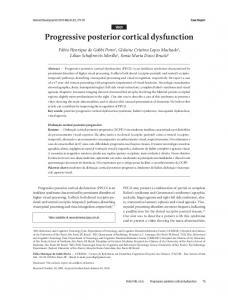 Report "Progressive Axonal Dysfunction Precedes ... - BioMedSearch"